This is a seventeenth century interpretation of what Anne may have looked like as a young girl. It is not modelled after Anne herself. The clothing seems more Elizabethan and the model doesn't look particularly English. This portrait is by the same painter of the Catherine of Aragon monkey portrait. It was probably done while Anne was a lady-in-waiting to Queen Catherine. by an unknown artist based on Holbein's style. It is unlikely that this painting was done during Anne's lifetime. It now hangs in Hever Castle. This is the most popular portrait of Anne. She is wearing her common black clothing and the french hood which is believed to have been made popular in England because of her. 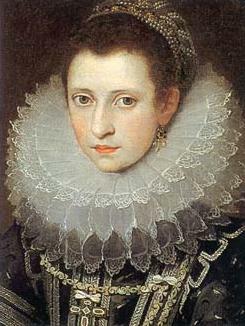 Since Anne spent much of her childhood in the French Queen's court, she adopted many French fashion styles. Although her eyes look somewhat tired, this portrait displays well the charm she used to excite the King with her girlish smile and graceful posture. This is a more modern interpretation of Anne. 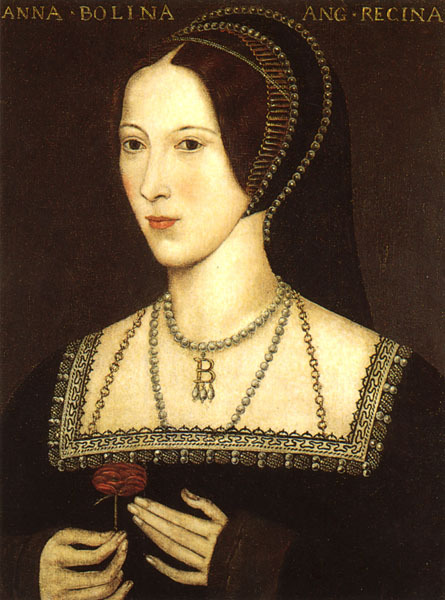 Like many portraits of the Tudor women painted after their deaths, it shows her holding a rose, a familiar Tudor symbol. This painting was probably modelled after the previous portrait. 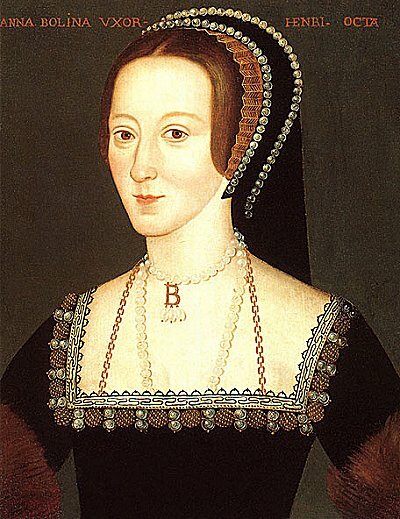 Anne is shown wearing a similar hood in both and she is shown with her signature "B" neck piece. 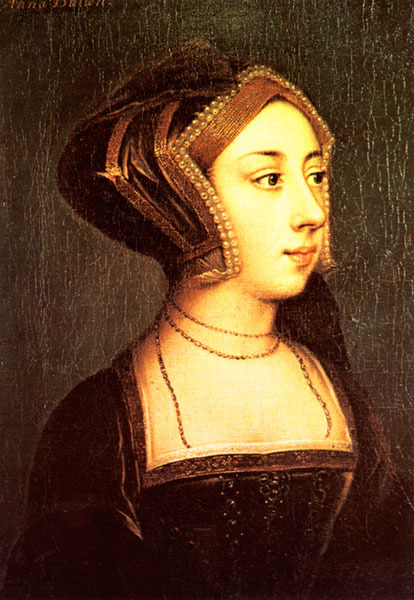 This portrait also hangs at Hever Castle. This photograph is part of a series of "portrait" photographs commissioned by the Deutsche Guggenheim Berlin. Mr. Sugimoto used four of the six wax figures of Henry's wives at Madame Tussaud's in London putting them against black backdrops and positioning them perfectly. Anne is shown with her traditional clothing and headress, but also with a mandolin. 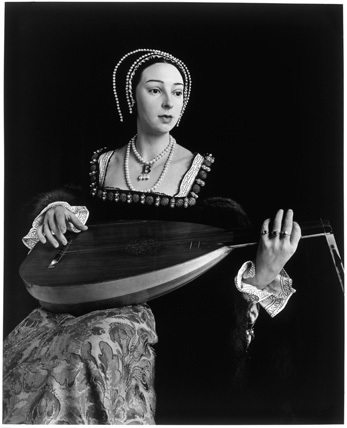 Anne is said to have been very musically talented, especially on the mandolin. Sugimoto's book "Portraits" can be purchased at Amazon and (to the best of my knowledge) contains portraits of the wax figures of Catherine of Aragon, Anne of Cleves, and Catherine Howard as well. Anne's portrait graces its cover. 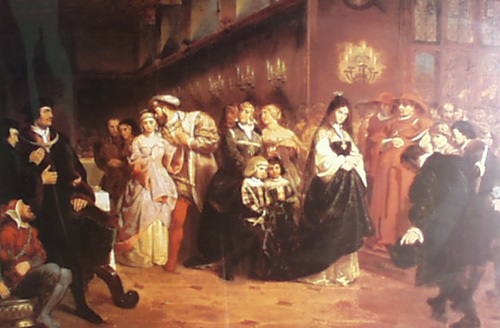 This painting of Anne and Henry with the courtieres was painted by a man most famous for his American art, such as Washington Crossing the Delaware. 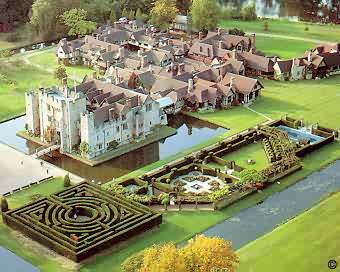 Hever Castle was Anne's childhood home. 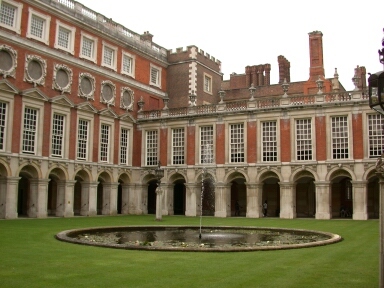 Hampton Court is a magnificent estate that was built for Henry VIII. Anne surely spent time here as Queen. 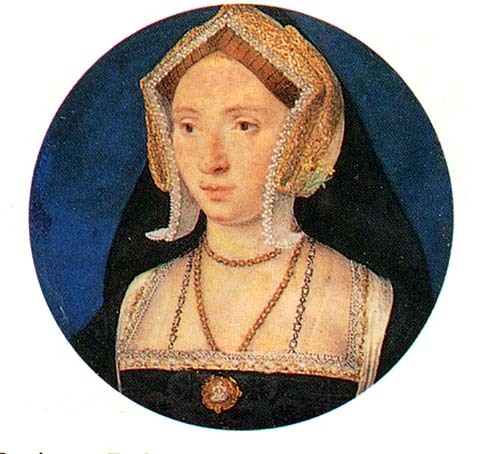 Along with Catherine Howard, Henry's fifth wife, Anne is said to haunt the palace. Tourists have seen an apparition of her likeness walking through its halls, sometimes carrying her severed head under her arm. This is a ring with portraits of both Elizabeth I and her mother. This must have been an incredible find. It was common for courtieres to wear jewelry with portraits of their soverigns in lockets but that both Elizabeth and her mother are present in this ring is quite remarkable. It would have been made around the middle years of Elizabeth's reign. 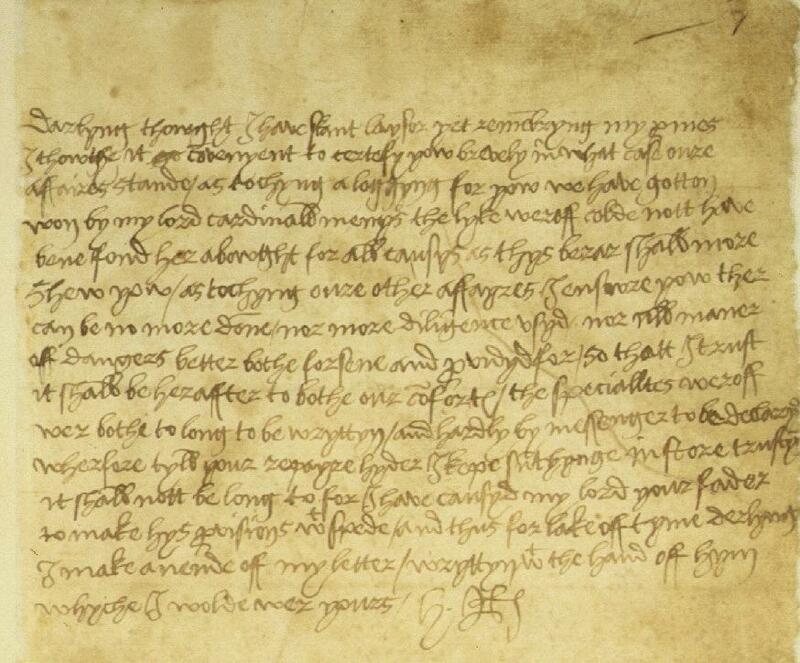 This is one of the 17 love letters that Henry wrote to Anne during their courtship and his marriage. Henry detested writing letters but the Vatican holds various letters written by Henry to Anne. 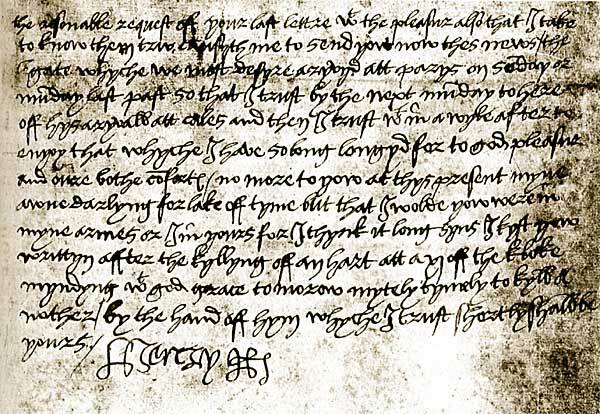 This letter is in Latin and written in Henry's own handwriting. This is another letter written to Anne. 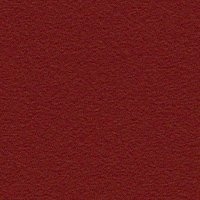 This one is short, no doubt as a result of the King's hatred of writing letters. A third letter written to Anne by Henry. A replica of Anne's necklace. 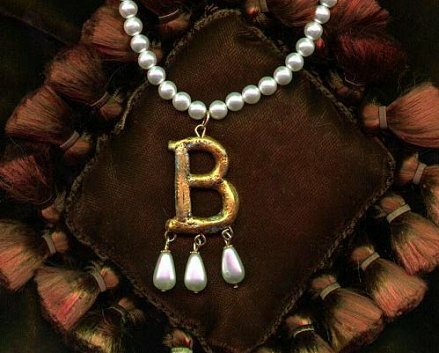 This is a modern day replica of the signature "B" (for Boleyn) necklace that Anne is commonly depicted as wearing. Porcelain collector doll of Anne. This is a picture of a limited edition collector doll from Acorn.